As promised, a report on the track days at Fernley. Its actually only a little over 850 miles to Fernley from my hideout in the San Juan Mountains (third mountain on the right, stop by anytime). Luckily, a lot of the miles are the most beautiful (to my eyes) on the North American continent. The first landmark of note was Lake Fowl, which seems a little low this time of year. Here you can see the "Hite Marina" and boat launch ramp. The real (original) town of Hite has long been under the waters of Lake Fowl (Powell). I left home two days early in order to photograph some rock art along the way, my first stop being a search for the Moqui Queen. I first heard about her 40 years ago and only got a good clue this winter. here she rules, complete with headdress and shell tunic. Her dog looks happy, eh? I had a good stop in Capitol Reef National Park to photograph more rock art and then on to the Fremont Indian State Park where I spent the nite. Yep, more rock art. As I cruised into Nevada, at a safe and sane 85mph or so, I often thought of the weather ahead - I had been warned Reno had rain on Monday but mostly was confident we would have some nice weather. At the Reno-Fernley Racecourse and whoop-de-doo park I was greet by some friends I had met before. Of course, the first question I answered was whether or not the top would stay on the car this year . . . . Registration and my first order of business - tech. Mike was there yanking and poking on a few cars. I was really anxious for my "science experiment" with Mike's new motor (it sounded great). Mike may fill you in on his weekend. http://images108.fotki.com/v613/photos/5/43175/9819052/fernley2011061-vi.jpg and then a quick familiaration tour of the track. Poor Chuck Engles hopped in my car to try to get a few action shots (Chuck may enterain you with his political trials during our track days) and found he was very welcome, but had to sit on the fire bottle during the quick two laps. That man has a love for the Pantera! http://images17.fotki.com/v10/photos/5/43175/9819052/fernley2011080-vi.jpg this is a pretty car! http://images17.fotki.com/v147/photos/5/43175/9819052/fernley2011087-vi.jpg unlike many Panteras, always there and brutally quick! http://images112.fotki.com/v106/photos/5/43175/9819052/DSC01978-vi.jpg the little hairdresser car - always willing. http://images12.fotki.com/v155/photos/5/43175/9819052/fernley2011122-vi.jpg it was great to be in the desert again! My trip was wonderful, renewing old friendships, meeting some I had never met before and even chatting w/ a few folks that I seldom have kind words toward (surprisingly civil folks). I understand the kart event was great fun. Some folks had more pit time than was proper and I hope all turns out well for everyone. Grouchy and Dirty and glad to be home . . . 28mpg on the trip home! I'm sorry to say that our well laid plans for TPR participation in this wonderful ORR began unraveling even before the beginning of our trip North to Arnold, NE. Frank (Godfather) had last minute difficulties with the installation of a new radiator to replace a leaky stocker that reared it's ugly head just several days before his departure date from Nashville. So, for the forth year in a row he found it necessary to head out in his "fake Pantera" (Mommy's Porsche) to do battle at the race. Upon arrival at Bud's (7-banger) home in Whiting, KS. the boys discovered that Bud's newly built engine was woefully low on cylinder pressure on all eight cylinders and in no shape for a road trip, let alone an ORR thrashing! At that point it was lucky that Bud was able to snag a ride with Frank to even be able to make it up to the event, let alone compete. I was able to begin my solo journey North on time and had a pleasant and uneventful trip to Arnold on Wednesday morning. Just before my arrival in Arnold I put in a quick call to Bud to determine where the boys had settled in (as if I didn't already know!) and found that they had already started paying rent at Jim's Bar on Main Street. I parked my car at the hunting trailer where Bud and our two East Coast Pantera brothers would be staying and hoofed it over to the Bar. There I found a frustrated and unhappy dynamic duo trying their best to drown out their sorrows by drinking up all of Jim's daily supply of beer. We all hung out there until I got a call from Mark at 10:00 PM that they were on the outskirts of town at which time I made a mad dash to meet them and lead them to the trailer. As soon as I had them parked, Frank and Bud had unglued their fanny's from their bar stools and hoofed it back. After proper introductions it was decided that our next move would be to break up the party and all get some much needed sleep in order to be somewhat awake the next day. Thursday morning dawned as a beautiful day amd Mark, Frank and I all easily passed tech and proceeded to another location for application of our car #'s and sponsor decals. There was then a "first timers" meeting that Mark and Jim were required to attend in the afternoon. Shortly after that we all were required to attend another racers' meeting before proceeding to a welcoming BBQ in the local park. It was right after this last meeting that my car decided it had a mind of its own and didn't want to get thrashed on in the race. Upon driving back to the trailer from the meeting it died and luckily I ended up coasting to the hunting trailer where it remained in the same spot until Sunday morning when we FINALLY got it running again.....BOO-HISS!!! I'll save all of the ugly details concerning getting it running again for a more comprehensive report to Asa for publication on the TPR website soon. Needless to say I was a VERY unhappy camper but later VERY happy that I was at least able to get the cat back home on Sunday! Let me just add to what Bud has already posted about our Pantera brothers, Mark Skwarck and Jim Wallace, in that these guys are the GREATEST!! It fell to them and them alone to uphold the tradition of at LEAST one Pantera competeing in SORC for the last 4 years in a row and they made it HAPPEN! You would be hard pressed to find more enthusiastic, affable, and Pantera savvy guys than these anywhere on Earth. Not only were they able to make an outstanding showing in the mile shootout, parade, car show and race but were MAJOR contributors to our 2-1/2 day thrashing on my dead car in order to get me home. For all these reasons, Bud,Frank and I are indebted to them and am enthusiastically hoping that they will again join us next year. I will send a more comprehensive report to Asa soon as I said earlier for those of you that might be interested in more details. I've got a lot more to report concerning the great folks of Arnold as well as all of our other adventures during the week and weekend so stay tuned! The email was simple enough, and short. A fatality had occured at the 2011 Silver State Classic Challenge. Later, after a media blackout was lifted, we learned 53-year-old driver Rick DeKneef of California and his 41-year-old navigator, Merle Hill of Ely, Nevada were killed when their race prepared 1994 Camaro left the road after suffering a tire failure. 1992 was the last time the course claimed a fatality. For the racers, friends and family, it's never an easy thing to take. Even so, the best families and friends pick themselves up to remember those who passed. Team Pantera Racing remembers them as well. Rick and Merle were no strangers to Open Road Racing. They were well known in the ORR community. 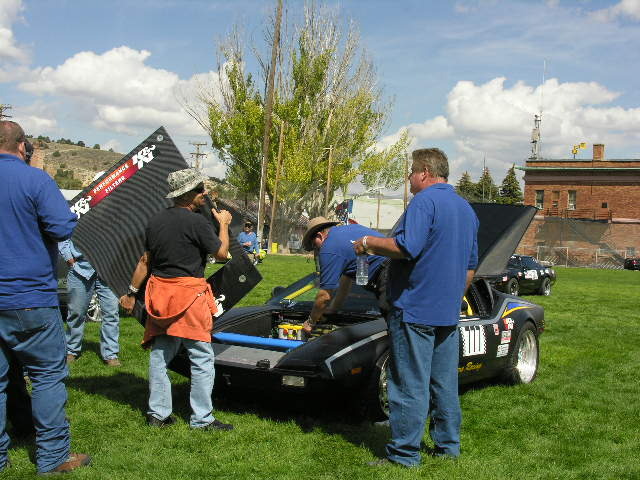 For 2011, they planned on competing in the Unlimited Division with a 1994 Camaro, fully race prepared. Unlimited literally means no speed limit. It's generally been considered Highway 318 can barely sustain a 200 MPH limit with the right car. For many years, folks have been chasing the last speed record slightly in excess of 200. We don't know for certain if Rick and Merle were going for the record, but when you enter Unlimited, it's always in the back of your mind. That's why you prepare the car for just about anything. Silver State Classic takes safety of the drivers and cars very seriously. In Unlimited, the rules are very strict, with requirements for fire-protected full race suits and underwear, roll cages, fire supression systems, harnesses, arm restraints, HANS, and more. The final item that in all cases is the most important, are the tires. Nearly every off-road excursion in the Nevada Open Road or Silver State Classic Challenge has been due to a tire failure. This is why their Tire Tech people take tires so seriously. Though tire failures can never be predicted, tire tech at Silver State has stringent rules all cars must meet. It is with great confidence we know the tires on this Camaro were in good shape; they never would have passed otherwise. Unfortunately, as unpredicted things tend to do, it was a tire failure that caused the Camaro to leave the highway at a speed estimated to be 200 MPH. Reports from the family indicate Merle and Rick died from traumatic impact injuries from the car tumbling through the desert, and not from the resulting fire. Being not easy to hear about death in any form, some comfort was taken they didn't die in the fire. That evening, at the Banquet and award ceremonies, there was a moment of silence held for the friends who started, but never finished. ...I can't help but think they were doing what they loved and they knew the risks... pushing the safety envelope to the very edge. ...both these guys will be missed. I spent half of Thursday and Friday with Rick in the parking lot his Camaro and my Pantera side by side.....yea the hard part is seeing someone go you will miss and know he will be missed more by his family. You do your homework, you prepare your car, install all the safety equipment you can afford, and work up in the speed classes until you've had enough. But at the end of the day, we all know something can happen and we end up upside-down in the dessert. There is no way to eliminate risk. In time we will deal with this loss and get back in the drivers seat. Family and friends will both miss these two veterans of Open Road Racing, and those friends will keep coming back. Daunted for only a little while, as the grief sinks in, passes and the memories turn to all the good times, Rick and Merle's fellow racers know they'd want them to go on. The memorial was held today at Kerman High School in Kerman, California. We'll all miss you terribly. And to show our support, Team Pantera Racing plans to come back in 2012, bringing memories of you with us. Rick is survived by his wife Kelly, son Ridge (who has raced with his dad many times) and daughter Kasey. Merle is survived by his mother Bunny Hill, and his children Tyler and MacKenzie. To make contributrions to the family, please contact Gail Waldman by going to the Silver State Classic internet site. The 2011 Sandhills Open Road Challenge is in the books. Last years runners Bob "Rowdy" Radefeld and Bud "7-Banger" Hower worked valiantly to get their cars to the race. Unfortunatley neither of them ran. Even so, they had convinced another Pantera team to come out. Mark Skwarek and Jim Wallace. Bud's new engine wasn't performing quite to his expectations, so rather than chance a blown engine on the way there or on course, Bud decided against running and instead became support for those who did. Bob took his Pantera there, but at the last minute (or actually the day before), his ignition went south for the summer. Not being able to repair it in time, Team Pantera Racing was down two Panteras. At least a third was still in the running. Mark Skwarek, in his nicely prepared orange and black pantera took on the event and finished 9th in the 110 mph class at +43.496 seconds. Another good time had in Arnold Nebraska by both Mark and his navigator, Jim Wallace. A big Thank You from Team Pantera Racing for upholding the team spirit, competing well and having a good time. What do you do when you can't wait for the latest round of paint? Or the paint vendor is backed up and can't get to you for a few months? Team Pantera Racing President Dennis "Mad Dawg" Antenucci recently had a local vendor create a vinyl "wrap" for his Pantera. The process was painstaking up front, having the guy come out and take measurements on the car. Then it was a matter of choosing the artwork and text and where to place it all. Dennis chose to keep everything simple, mainly to keep the car one color. He also added some information on past Open Road Racers who are no longer with us; a kind of tribute to those who have gone before. For more photos, please visit the photo album.